Jess Butcher is the CMO and Co-Founder of Blippar, and chief proponent and evangelist for the new verb “to blipp.” Follow her @jessbutcher. Margaret Thatcher. Like her or loathe her, Britain’s first female prime minister made her way in a man’s world and changed the way we think of women politicians. Stop benchmarking yourself against other successful entrepreneurs or business people – it wastes valuable energy! Your personality and circumstances are unique and there is no right or wrong way to grow an innovative business. Yes, learn from others’ experiences and be inspired by them, but also make your own rules and navigate your own path. Trust your gut instinct as much if not more than the numbers, and surround yourself with people who you respect and enjoy working with. The occasional error of judgement or wrong move can often move your business faster than the right ones. To be honest, I don’t think we’ve made any big errors of judgement – only wasted time and effort that could have been better spent – but you tend only to appreciate that in hindsight, and re-focus accordingly. Knowing when to stop and draw a line under a particular strategy or approach is critical. About-turns are not weak, they’re strong and demonstrate good leadership, but they need to happen quickly and be communicated decisively. Don’t pay yourselves until you have to! That, and hire a good finance director. This isn’t always possible from startup, but having that skill set within your founding team seriously helps. If you’re fortunate enough to have a product or service that you can trade for another, then “in kind” deals can help a lot with cash flow in the early days. Possibly a slightly strange one – but if you haven’t already got one, find a good “better half” or at least draw closer to those real friends in your life whose support you’ll need. The life of an entrepreneur is all-consuming, with a poor work-life balance and a roller coaster of highs and lows. Having one personal, special cheerleader who celebrates your highs with you and brings you out of despondency during the lows makes all the difference and keeps you focused and balanced. For us, there’s a simple measure of success: when to “blipp” becomes as ubiquitous a verb as googling or tweeting, and as habitual an everyday behavior. 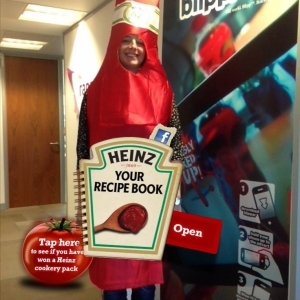 Everywhere we go in our daily lives, we will be surrounded by physical images and objects annotated with Blippar ‘b’ instructions, which tell you why each is worth blipping and unlocking for a unique content experience. We will simply look at the world around us through an enhanced Blippar lens – whether via our phone or maybe even hardware we wear – and the world will instantaneously jump to life with additional content experiences.